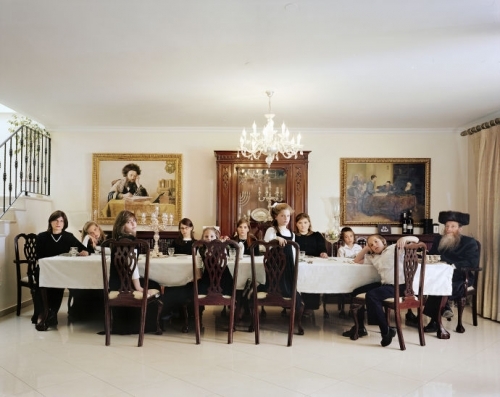 This Place, an exhibit now at the Brooklyn Museum after stops in Prague and Tel Aviv, collects the work of twelve international photographers, made in Israel and the West Bank during extended visits between 2009 and 2012. One of those photographers, Frédéric Brenner, conceived the project as a way to approach a fraught and familiar subject from a number of fresh perspectives. In the exhibition’s catalogue, he writes, “I wanted to find collaborators who were not embedded in the daily conflicts and dialectics of Israeli and Palestinian life, and who could look without complacency but with compassion. . . . I was determined to identify artists who were driven by questions, who embraced uncertainty and paradox, and who, through their highly individual work, could illuminate the many fault lines of this place.” A French Jew best known for pictures documenting the Jewish diaspora, Brenner had come to see Israel as “a place of radical alterity, of radical ‘otherness,’ ” so “it made sense to invite ‘others’ to question ‘otherness.’ ” Of those others—Jeff Wall, Thomas Struth, Josef Koudelka, Rosalind Fox Solomon, Gilles Peress, Nick Waplington, Fazal Sheikh, Jungjin Lee, Wendy Ewald, Stephen Shore, and Martin Kollar—only a few had ever been to the country before, and none had produced a substantial and focussed body of work there.